It is no coincidence that many of Lurelle Van Arsdale Guild’s 1930’s designs for aluminum tableware reflect his honed knowledge of traditional forms and ornament. Before becoming one of America’s top industrial designers of the early to mid-twentieth century, Guild was an antique furniture dealer and throughout his entire life, a collector and connoisseur of historical design. Having written The Geography of American Antiques in 1927, followed by The American Home Course in Period Furniture in 1933, Guild balanced tradition and modernism in his aluminum designs in the 1930s, notably in his designs for Kensington Incorporated. 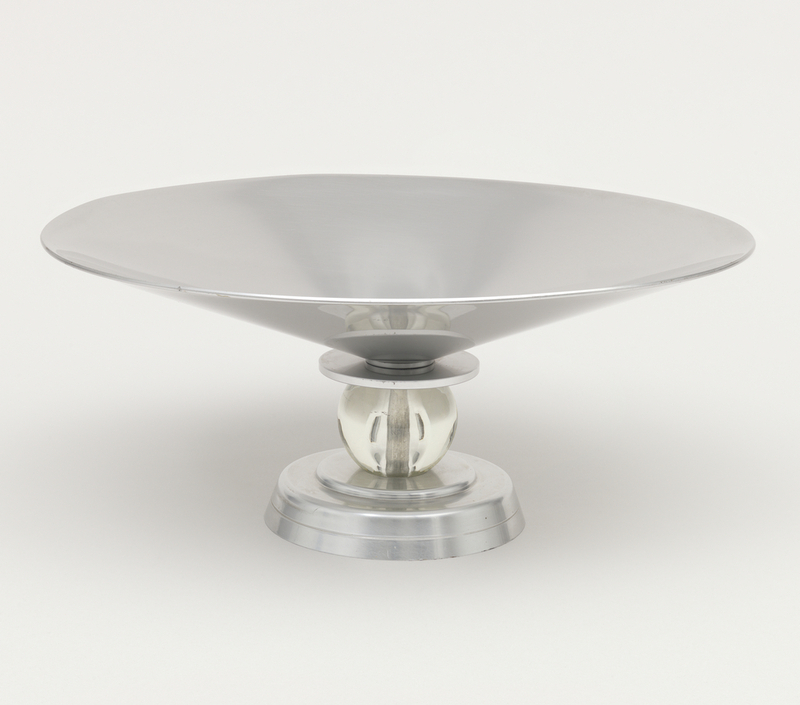 Designed in 1934 for Kensington Inc., a subsidiary of the Aluminum Company of America (Alcoa), this footed bowl was named “The Stratford Bowl.” Advertised as a centerpiece with a matching pair of candleholders, the Stratford Bowl originally retailed at $10.00 and was described as being “a most satisfying decoration for the buffet or side table.” It is one of Guild’s more modern designs, eschewing the classical pictorial brass ornamentation found on his other pieces for Kensington, like the “Marlborough Vase“, also designed in 1934. Kensington Ware was launched in 1934 and the company heavily advertised during the late 1930s. Guild continued to design for the company throughout the 1940s, expanding into furniture in 1947, when Alcoa introduced an aluminum and hardwood furniture line. Aluminum was an alluring new metal for domestic products. In a 1934 advertisement Kensington publicized their products as being “Authentic interpretations of Beauty in an entirely New Metal.” Guild’s simple forms, with their allusions to traditional styles, exquisitely convey this new interpretation of beauty. Stratford Bowl; 1934; Designed by Lurelle Van Arsdale Guild (American, 1898–1986); Manufactured by Kensington Inc. (New Kensington, PA, USA); aluminum, glass; Gift of Mel Byars, 1991-59-11.